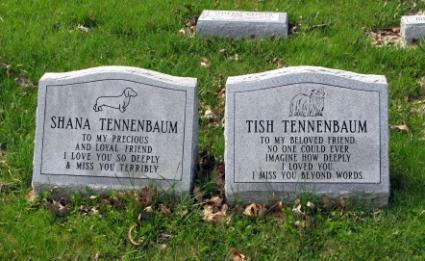 A pet epitaph is a memorial for your pet that is engraved on a headstone or on a box containing the his ashes. Those who have lost a pet will experience a number of emotions, and grieving for a pet from a Christian perspective will not shield the owner from pain. It may, however, provide some comfort during this most difficult time. A dog urn is a container for placing the remains of your beloved pet. As you consider burial options, cremation might be your choice for your canine. To many, mourning the loss of a pet is similar to losing a close friend or family member. Pets are constant companions; many living with their owners for numerous years. Just like a close friend or family member, a beloved pet cannot be replaced. Mourning the loss of a pet is more common today than in years past. For example, your pet, whether it be a dog, cat, lizard, fish or bird, can be buried at a pet cemetery instead of your own back yard. You can purchase a casket for your deceased animal or have him or her cremated. You can create a pet memorial, purchase cremation jewelry and even have a website in your beloved Fido's memory. The possibilities are endless. Make sure you are comfortable with whatever you decide to do to remember your pet. Nowadays, it's not uncommon to hold a memorial service for your pet, with services held that are similar to that of a human. Eulogies and memorial poems and condolences are also appropriates, as are purchasing sympathy gifts, such as a gift basket or piece of jewelry. It doesn't matter how old you are or where you live, losing a pet is a sad experience. The emotions and grief that come along with it are real and normally don't go away with getting another pet. Take a look at what LoveToKnow's Mourning the Loss of a Pet has to offer. If you like what you have read, let us know. If you don't like it, then let us know that too.